Berovo is situated in the Malesevo Mountains, in an area known as "little Switzerland", in eastern Macedonia. It's the seat of Berovo municipality. 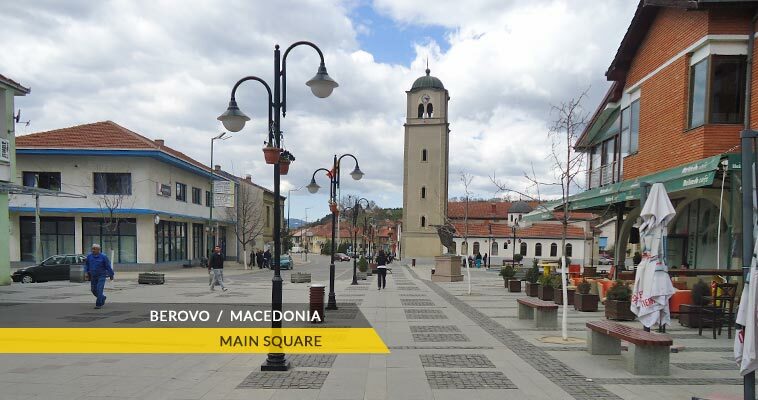 Sustained by the Bregalnica River, Berovo stands at 830-900 meters (2,725–2,950 ft) above sea level and can be reached by car using a single asphalt road. Berovo lake and the forest of the Malesevo Mountains are two popular sites for tourists and Berovo craftsmen are well known for their skill in traditional wood crafting. Berovo cheese is also a well-known commodity. Berovo s situated in the 158 km (100 mi) from Skopje, 54 km (29 mi) from Strumica and 52 km (32 mi) from Kocani, in Republic of Macedonia and very close to the border with Bulgaria. The inhabitants of Berovo and the Maleshevo region as well, are amusing mostly in the field of the agriculture/farming. Due to the specific of the region, Berovo is well known for its potato and the white cheese of Berovo. The Malesevo region is full of pine and oak trees, which is why Berovo craftsmen are well known for their skill in traditional wood crafting. Two version exist for the name. According to the first, it was named after a cattle-breeder Bero, who used to have a land in the area nearby. According to the second, the name came out as people started to gathering in the area (on Macedonian gather=bere). The climate in the Berovo region is mildly continental with a certain characteristics of mountainous climate. The Berovo area has considerable lower mean temperature during the year, comparing the other areas within the Berovo region. At an altitude of 800 meters above the sea level, the average temperature is 11,1°C, while in Berovo is 8,7°C. The coldest month is January with an average temperature of -10°C, while the warmest month is July with average temperature of 18°C. The average year minimal temperature is 2,8°C and the average maximal temperature is 15,3°C.